I have always loved sending and receiving Christmas cards. If you're on my list, you've probably already received yours. I now have a favor to ask of my blog readers, no matter where in the world you are. I would like you to mail a Christmas card to a couple in P.E.I. Why? Their son can explain better than I. Here are words from him, Mark Enman. "This is a newspaper article about my mother Bev Enman and how she cherished the tradition of sending Christmas cards. My mom and her husband Donald have had a very rough few years. Both now live in a long term care facility due to the fact that they both suffer with dementia. Here is what I need from you.........It is simple.......My mom loved the movie Miracle on 34th Street. 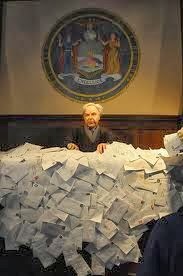 The part when all of the mailbags with letters addressed to Santa are dumped into the court room was her favorite. I want that same miracle for them. Please take the time to send them a Christmas card. If you don't know them, no matter. This would mean the world to them and my family, that suffers with them, especially this time of year. I would love to see their rooms flooded with Christmas cards. Please help me do this." Such a small gesture, huge impact.